Developing Our Christian Life is the sixth in a series of seven volumes of the foundational series prepared to compliment and reinforce the Gentle Shepherd Ministries Discipleship Course. Each volume addresses a different theme of the Christian life. 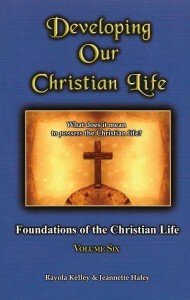 The sixth volume explains what it means to possess the Christian life. The problem with much of the presentation of Christianity is that it is often treated like a religion, rather than a life that has to be conceived in the heart by faith, developed in obscurity, established in adversity, and lived out in the various settings of the world. In a sense, the word “Christian” has been hijacked by most religions as a popular façade or title. However, these religions do not adhere to the fundamental beliefs of the Christian faith that was first delivered to the saints two thousand years ago. This foundational series was written to set the record straight about what constitutes the Christian life. For example, the first book in volume six, The Many Faces of Christianity, exposes the varied presentations of the Christian life that simply serve as a mask, veneer, or cloak, but falls short of manifesting the life of Christ. The second book, Possessing Our Souls, reveals the digression of a person’s soul if he or she fails to possess his or her soul in the patience of meekness and in the power of the Holy Spirit. In the third book, Experiencing the Christian Life, the author shows how the presence of God is necessary to actually discover, experience and live the Christian life. The fourth book, The Power of Our Testimonies, reveals the importance of having a strong testimony. However, as Christians, our testimonies will only grow as we mature in our Christian walk. The final book, The Victorious Journey, addresses the choices that must be made in light of eternity, and reveals the obstacles that the spiritual sojourner will encounter along the way. It emphasizes what it means for the Christian to be victorious in his or her Christian walk. The sixth volume will prove priceless to those who recognize the Christian walk is no picnic, but that it carries lessons and treasures that will prove rewarding and eternal to the spiritual sojourner.